Cinemusic: All That Jazz | Warped Factor - Words in the Key of Geek. From the golden age of silent film to its decline with our next sonic pit stop. The year is 1927, & the film we'll be dissecting here is considered the first of the talkies - that is, containing actual audible dialogue & synchronised sound - a revelation given the times! Curtain up, then, for The Jazz Singer. Using one of the last sound on disc systems, which is to say that the soundtrack was not actually part of the celluloid film but issued on separate gramophone records to be played alongside it, known as Vitaphone after a combination of the Latin & Greek words for "living" & "sound", the story of Jakie Rabinowitz/Jack Robin & his rise from outcast Jewish son to living his jazz dreams was arguably the perfect showcase for this new way of hearing things. 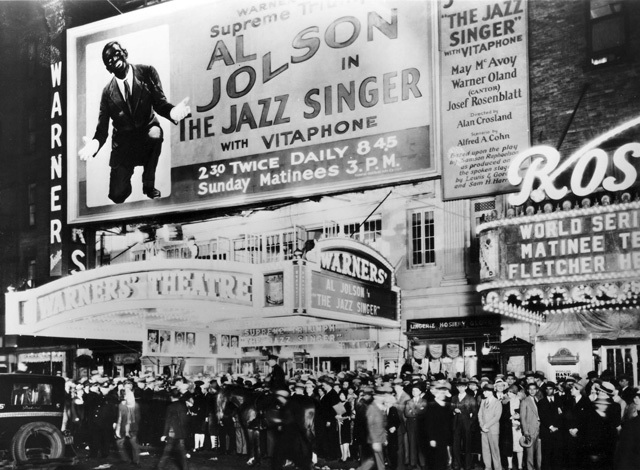 The first time it's really shown off is following a performance of Dirty Hands, Dirty Face, during Al Jolson's Jakie's banter with his band's pianist & the crowd at a cabaret. It's part of just two minutes of actual in-sync talking featured in the 89 minute running time, the silent age still not quite shaken off as intertitles of the sort common to conventional silent film still run throughout by way of description of the action. All of which was based on The Day Of Atonement, a play by Samson Raphaelson - who had seen Jolson on the musical theatre stage & was suitably impressed! "I shall never forget the first five minutes of Jolson—his velocity, the amazing fluidity with which he shifted from a tremendous absorption in his audience to a tremendous absorption in his song." With that in mind a short story had been published in January of 1922 in an issue of Everybody's Magazine, followed by the stage adaptation which would in turn spawn the film. Those all important first words spoken by its star were adapted from his stage patter. "Wait a minute, wait a minute, you ain't heard nothin' yet." Indeed audiences hadn't, so how oddly prophetic! $422,000 well spent by Warner Brothers, an astronomical sum at the time as well as the breaking of a previous cap of around $250,000 per picture. One of the four brothers, Sam, had been a tireless advocate for the Vitaphone system but would die of pneumonia the day prior to the film's première. "A key to Vitaphone’s success was its use of electrical recording and amplification. Originally, the phonograph was a mechanical device, which utilized a cone as both microphone and loudspeaker. Sound waves transmitted via the cone would vibrate a stylus traveling through a rotating surface of soft wax, to produce a groove. When transferred to the firmer surface of a shellac record and played, it could reproduce a tolerable copy of the original sound, loud enough to be heard in a small room. But without amplification, it could not fill even a 100-seat theater. Electrical recording and reproduction technology gave Vitaphone the power to reach the back row of a 3,000-seat movie palace, with unprecedented audio fidelity. The American Telephone and Telegraph Company (AT&T) created most of the technology that would make Vitaphone possible. 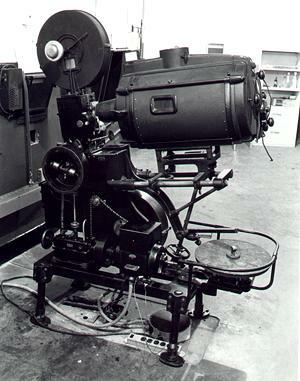 Western Electric, the manufacturing arm of AT&T, had built a system for electrical sound recording and playback in synchronization with a motion picture as early as 1925. Yet the national telephone monopoly couldn’t figure out how to sell this invention to the movie business. All the major film studios had witnessed the failure of previous “talking picture” gizmos. None of them wanted to upset their profitable apple cart by throwing away money on some new version of a proven folly." Many years after it had in fact been proven far from a folly, a remake was mounted - the idea of revisiting the classics not exclusive to modern cinema. Only this time there were to be two rehashes of the same basic concept, as a 1952 version was followed by a 1980 attempt starring Neil Diamond, who is perhaps best known for several chart hits including Sweet Caroline - actually an ode to assassinated US President John F Kennedy's daughter! A version of his Girl, You'll Be A Woman Soon as performed by Urge Overkill would later appear in Quentin Tarantino's Pulp Fiction, which we'll be returning to the near future. Not everything Diamond touched turned to gold, mind. His attempt at The Jazz Singer was universally panned even if did give him three charting singles in the shape of America, Love On The Rocks & Hello Again. The soundtrack at least got him a Grammy nomination for Best Album to salvage some pride, Love On The Rocks put up for Best Original Song at the Golden Globes. Within four years of making the film he would be inducted into the Songwriters Hall Of Fame, 2011 bringing an induction into the Rock & Roll equivalent courtesy of Paul Simon. He also contributed to the success of the Monkees as a songwriter, penning what could be termed their signature song I'm A Believer, as well as A Little Bit Me, A Little Bit You, Look Out Here Comes Tomorrow & Love To Love. Contrary to popular belief he didn't actually write these on commission for the band - Davy Jones, Peter Tork, Mike Nesmith & Mickey Dolenz brought together following auditions by producers Bob Rafelson & Bert Schneider for a television series to capitalise on the growing American popularity of the Beatles, whose appearance on the Ed Sullivan Show sent things into overdrive to the extent the Fab Four stopped touring altogether after a show at San Francisco's Candlestick Park in 1966, sick of being unable to hear themselves play over hordes of screaming teenage girls. The diversion into rock & roll by way of a finale is pertinent, for it & its heyday on film is where we head next. Whooo, to quote both Little Richard & Sir Paul McCartney!